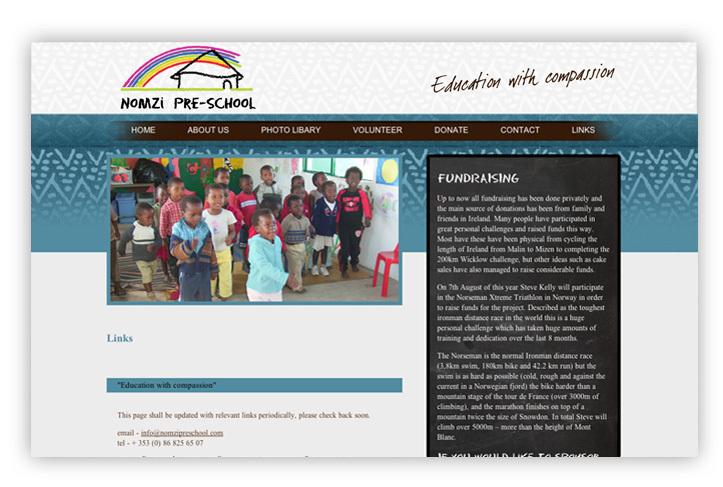 Nomzi Pre-School is an independent community based project established in 2000, situated in the former Transkei region of the Eastern Cape, South Africa. Its goals are to provide free education using local and international teaching methods in a compassionate way, and to improve the young peoples health through a feeding and health program. 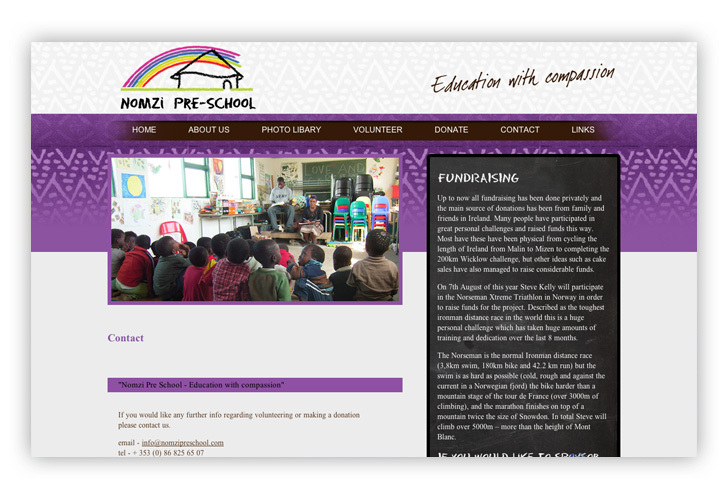 We coded their website and created a gallery for them, along with a mechanisim for people to donate funds and to volunteer for this worthy cause. Up to now all fundraising has been done privately and the main source of donations has been from family and friends in Ireland. information site to deatil their services. 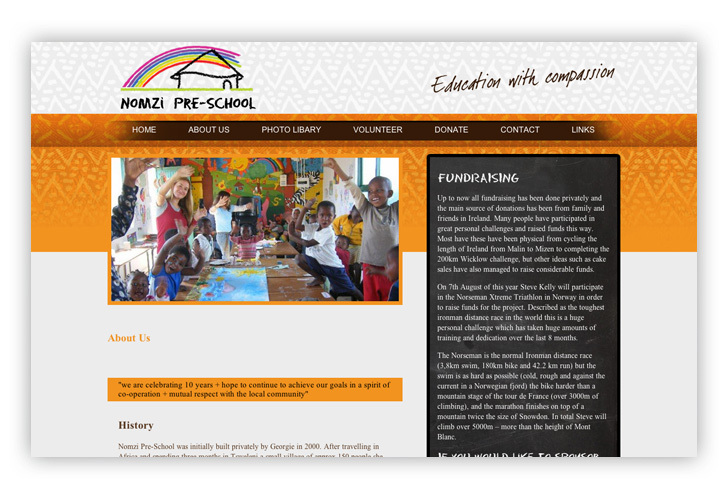 The success of Nomzi Pre-School directly results from the co-operation between the local community and international volunteers. There is also a community committee who is consulted on various school issues. provide perfect backdrops to the childrens smiling face. We added a gallery section with a slideshow to whow the stunning surroundings. 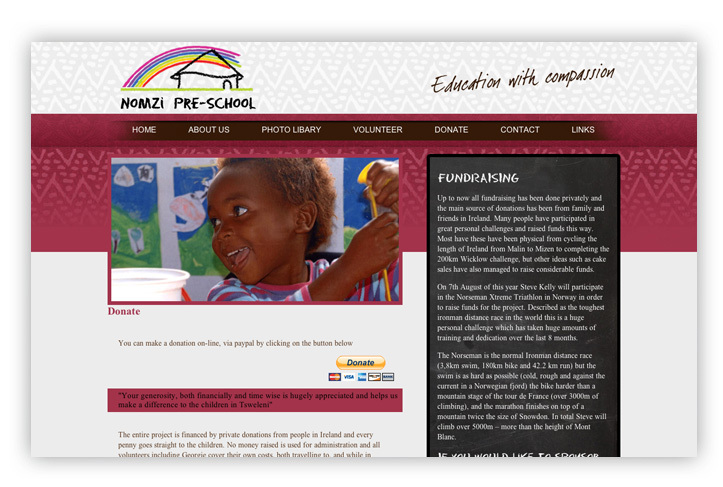 Nomzi Pre-School are constantly searching for suitable volunteers. The area is very remote and the standard of living is very basic, i.e. no running water and little access to electricity, so only those who would be able to ‘rough it’ should consider taking a position! 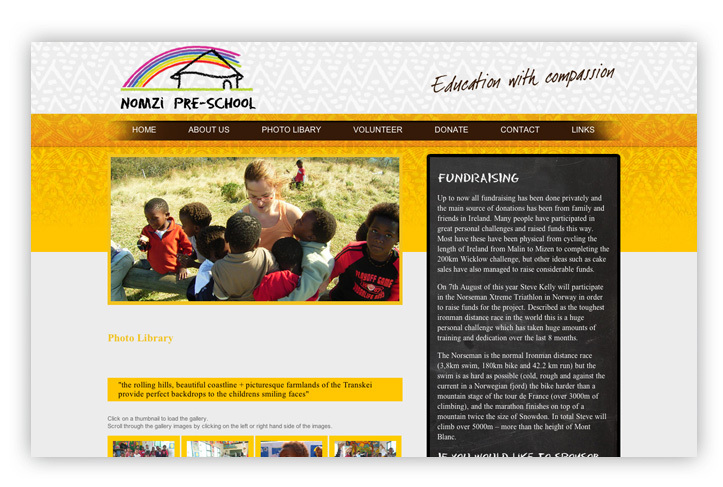 We added a facility so users can donate online - via paypal..
No money raised is used for administration and all volunteers cover their own costs, both travelling to, and while in Africa. Previous Irish volunteers have built playgrounds, organised music and art workshops, planted an orchard, and started up a vegetable garden. 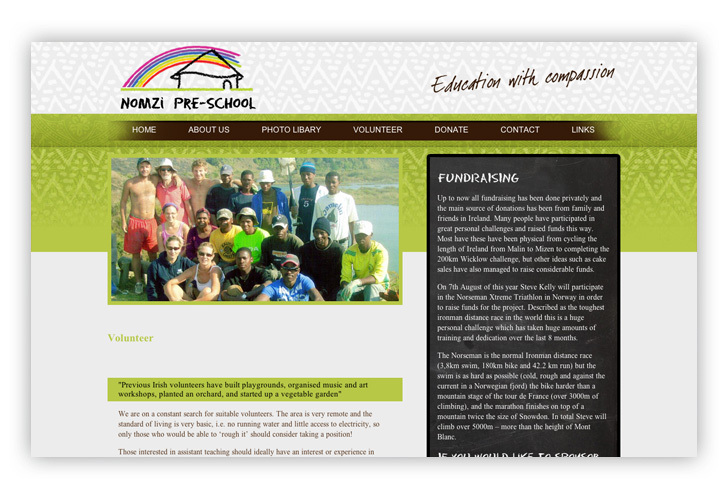 Helping in this way is extremely beneficial to the further development and all round education of the children. As part of the project a full health program has been implemented. On entering the school program each child is given a full examination at Isilimela hospital. Each child is de-wormed every three months. Children are tested for TB if there is cause for concern and medication is administered if necessary. TB positive children are taken to hospital regularly for their condition to be monitored.
" I strongly recommend Ger to anyone who is serious about setting up and getting the best out of their website. I felt he knew what I was looking for and he achieved what I wanted in an efficient way and in a short time. 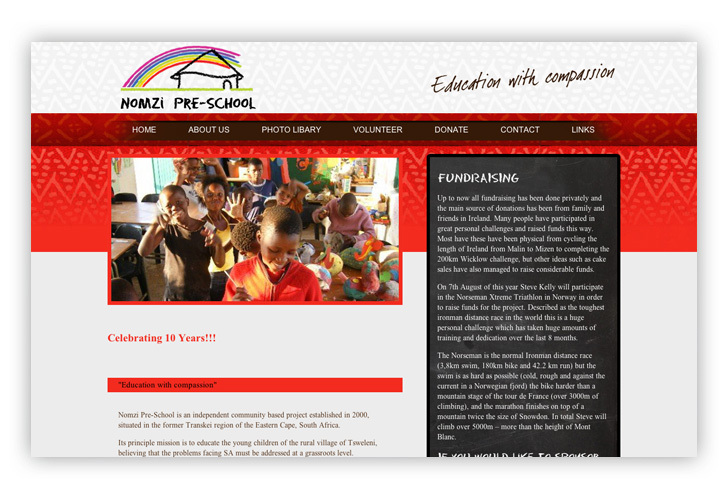 He was professional yet friendly and as the website was for a charity he was extremely generous with his time and resources. I am intending to set up a business website in the near future and will definitely use Ger again, I know I can rely on him. I have no hesitation in giving him a sincere recommendation." We love constructive feed back on our work so we can continue to create usable sites that keep users and clients alike happy. * We will never display or give your email address out to anyone. © 2011. TextBXDesign. All rights reserved.